Mario's Gloves are a part of Mario's clothing. He wears them in every game, except the first games (i.e. Donkey Kong or Donkey Kong Jr.), and in games where he is a baby. 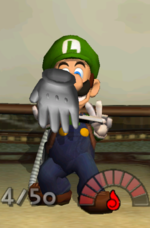 In Luigi's Mansion, Mario loses one of his gloves inside the mansion, forcing Luigi to search for it. It is eventually found in the Projection Room after clearing the Cinema Ghosts haunting it. In the 3DS version's Hidden Mansion, however, it is instead found in the Courtyard after clearing all of the Ceiling Surprises and Purple Bombers in the area. After giving it to Madame Clairvoya she says: "Wh-what is this? If it isn't Mario's Glove! Ah-hah! Still damp with the sweat of the living!" Even though Mario "lost" his glove in Luigi's Mansion, he is still shown wearing them both while in his painting. The same applies to his hat and shoe. This page was last edited on December 1, 2018, at 16:17.